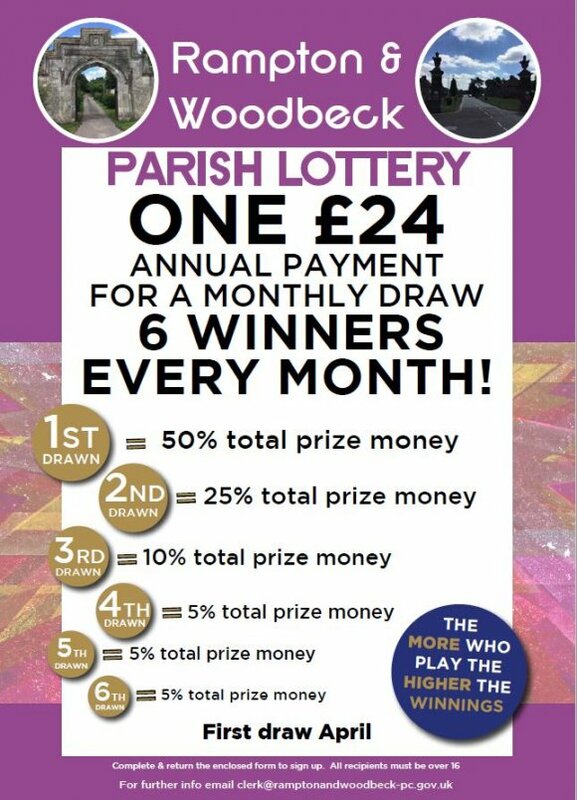 Rampton & Woodbeck Parish Lottery' is promoted by Rampton Parish Council by the power of the Lotteries & Amusements Act 1976 and holds Small Societies Lottery Licence number SL0218 under the Gambling Act 2005. A small society lottery is a lottery which is promoted on behalf of a non-commercial society, which is established and conducted for either Charitable Purposes, support or participation of sport, athletics, a cultural activity or any other non-commercial purpose other than that of private gain. It is an exempt lottery, in that the small society lottery does not require a licence from the Gambling Commission. Rampton & Woodbeck Parish Lottery sales shall remain below £20,000 per lottery to be classed as a small society lottery. Rampton & Woodbeck Parish Lottery complies with the regulations which require at least 20% of the proceeds to the purpose of the lottery, we have set this at 50%. No single price will be worth more than £25,000 and we do not operate a 'rollover'. Rampton & Woodbeck Parish Lottery is intended to raise funds for 'good causes'. The draw will take place once a month at Rampton Village Hall, during the interval of Bingo Mania! by the Village Hall Warden (witnessed by those present). If you win, payment will be made electronically to your bank account and a notification sent to your designated email address. If you do not have email, we will write to your home address. The prize money will be 50% of the membership fee taken that month. The remaining 50% remains in the Rampton & Woodbeck Parish Lottery bank to build up a fund for the sole benefit of anywhere within the civil parish boundary of Rampton or Woodbeck. The purpose of Rampton & Woodbeck Parish Lottery is to act as a Club to raise funds be for the maintenance and improvement of community assets/good causes within the Parish of Rampton & Woodbeck. The money will be paid into the 'Rampton & Woodbeck Parish Lottery' bank account, held until used to meet funding requests for community assets from the parish council to specifically use for the aforesaid purposes. Examples of 'good causes' within the parish may include (but not limited to) a new piece of equipment, items or replacement of existing parish equipment or items, eg seating, play park and recreational equipment, village hall, flower planters, etc... The Parish Council are happy to hear your views on potential ideas to spend the money in the parish and will take these into consideration when spending proceeds of the lottery for a specific purpose. We believe in being transparent, each year we will issue a statement of our accounts at the Annual Parish Meeting each May and publish this on the Parish website. Each month we will upload the winning ball numbers and prize amounts on the website.